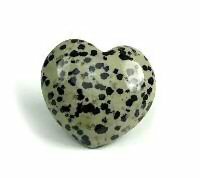 Polychrome Jasper puffy heart shaped gem stone is beautifully polished. 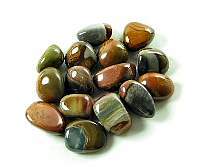 It is also called Desert Jasper or Royal Savannah Jasper has a happy energy. It is said to bring good fortune and a happy outlook on life. Jasper is a crystal of gentleness and relaxation. It is professed to enhance one's ability to relax and bring tranquility, comfort, and healing. 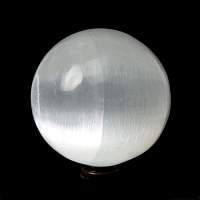 It is used to stabilize your personal energy and aura, especially during astral travel and for grounding oneself. It is said to help with contentment, compassion, nurturing, consolation, and courage for conflict ahead and gentle endings. 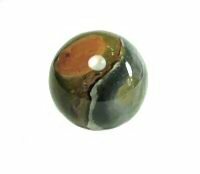 Jasper is slow to show a change to the person, but is a basic good stone that one should always have it on hand. Jasper comes in many colors. All colors of Jasper will help balance the vibrations of the body. It is also used to assist in attuning to and communication with animals. 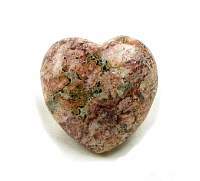 Metaphysical healing lore says that Polychrome Jasper healing crystal is used to ease stress and increase stamina, and the ability to adjust to change. It is also used to ease allergies and is said to be good for the liver, gallbladder, and soothing to the stomach. 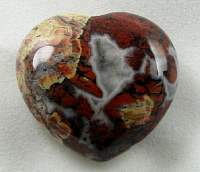 Polychrome Jasper was discovered in Madagascar in 2006. It was named for its multi colors. The colors are a mix of mottled sand, rusty to chocolate browns and gray green hues.